i've frozen for a second to give this dress justice. the latest of my diys. the real ones from topshop, the AMELIE was too expensive for me and the moment i decided to blow off my hard earned 75 pounds, they were sold out. so i would call it destiny. Wow, girl! You've just outdone yourself with the shoes! Love the dress, though haven't seen it in H&M yet. Amazing!! When i first saw them I thought they were the Topshop!!! and where is the dress from? it's amazing. wow, that's one amazing DIY!! congrats to you girl! p.s. love the dress on you, I managed to snag it from my local H&M too! Did you shorten it? LOVE those boots and that dress. Fabulous !! OMG. YOU did THAT?! How, in God's name? You're amazing!! These studded heels are dirty cool! Your look amazing also. I love your style and your blog hun. you are a diy master girl! very nice! those shoes are awesome! i love the tights! 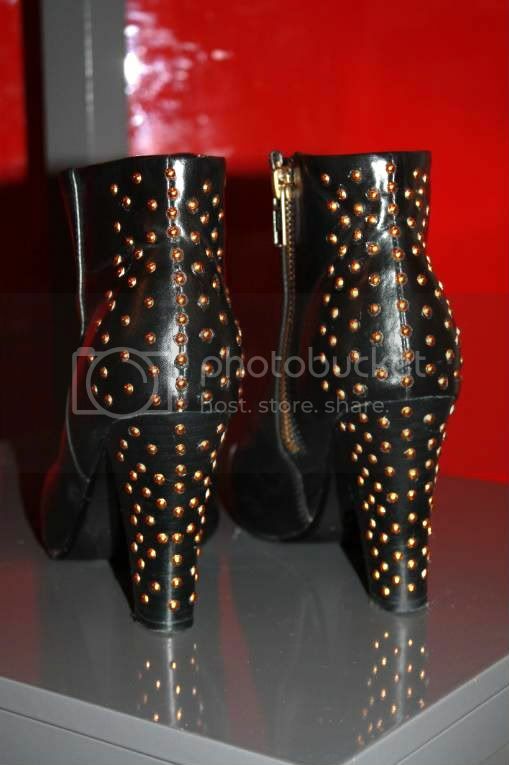 and the studded boots are amazing! You're so talented. Well done you! AMAZING DIY booties. You did such a great job! I love the dress and the boots!! You look glorious in the dress! Freezing was totally worth it. Weirdly enough I liked neither the dress, nor the jumpsuit on me *lol* Hope they made someone else happy. Anyway, girl, you need to do a tutorial on the boots, seriously. It's a MUST. you GLUED them right? what a great idea :D heheh I thought they were topshop too when I first saw them. Great job! Hopefully none will fall off though, right? Love the zebra print too, reminds me of the H&M ones! die schuhe sind soo toll! Wie cool ist das denn, ich hab genau die gleichen H&M Stiefel, wo kann man solche Nieten kaufen? 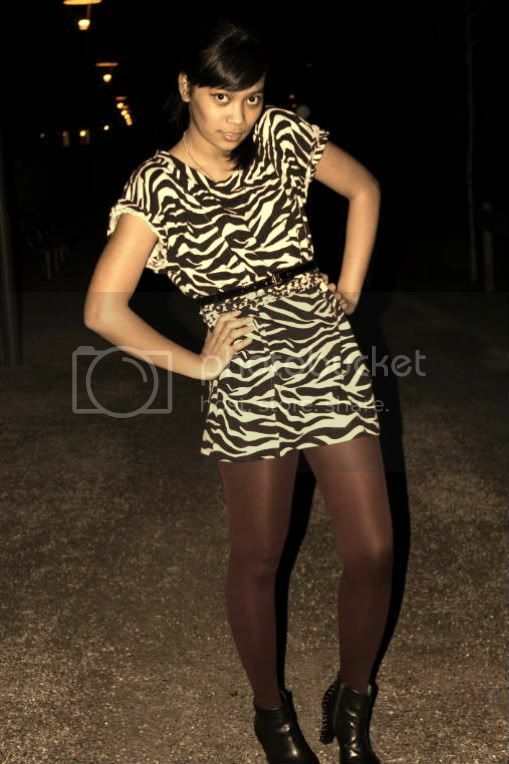 Seems like multicoloured tights is THE WAY to wear a zebra-print dress! And the shoes have turned out beautiful. Too bad here in Greece we can't even contemplate the Topshop ones... Maybe I should get a stud gun? i want your shoes right now!!!! you look amazing, I adore this outfit! and wow, fabulous job on the boots!! I looked a few posts down and the aa skirt looks great on you - how AMAZING are they?! Ah what a great DIY! I find it amazing how you can juggle being a mommy, working and DIY-ing at the rate you do. Genius, woman! wow! you really are great with diys. damn i love the heels! great job!